The difficulty in regard to rheumatic diseases is that the problem is insufficiently appreciated and understood. As part of the ongoing eumusc.net project we would like to keep our data as up-to-date as possible. 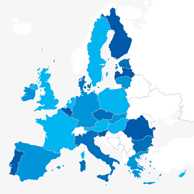 Eumusc.net, is a three year project to raise and harmonise quality of care and enable equity of care of rheumatic diseases and other musculoskeletal conditions across all the EU Member States. Musculoskeletal conditions are common; they are the biggest cause of physical disability, incur major social costs and are a major cause of lost productivity. There is enormous potential to reduce this large and growing burden across the Member States through evidence-based interventions and harmonisation of the standards of care. To achieve its aims, eumusc.net has developed the first European agreed patient-centred Standards of Care for people with OA and RA. It has also developed methods that provide each Member State with the tools to measure the burden of these musculoskeletal conditions and to monitor the quality of care that is being provided. We hope the tools provided by eumusc.net will enable patient organisations, health care professionals and policy makers throughout Europe to keep up the good work and strive for equity for all people suffering from musculoskeletal diseases across the EU Member States. It’s in your hands now! To keep up to date with our news, events and activities please click on subscribe in the top right hand corner. The 9th meeting of the European Parliament Interest Group on Rheumatic and Musculoskeletal Diseases was held on 26 June 2012 at the European Parliament Brussels under the heading “RMD’s and Pain: Facts and Findings”. On the third day of the Eular Congress 2012 Professor Anthony Woolf presented eumusc.net at a press conference in the Press Center at the Berlin Messe. The abstract “Development of userfocused standards of care for rheumatoid arthritis” relating to the work that has been done in Vienna for workpackage 5 was presented on Saturday and is won a EULAR Abstract Awards for Health Professionals. Relevant information for healthcare professionals throughout Europe will be published in this section of the website. Subscribe to our newsletter if you want to be informed about new issues. Relevant information for policymakers throughout Europe will be published in this section of the website. Subscribe to our newsletter if you want to be informed about new issues. Relevant information for patient organisations throughout Europe will be published in this section of the website. Subscribe to our newsletter if you want to be informed about new issues. Pressinformation packages, photo's and pressreleases will be published in this section of the website. Subscribe to our newsletter if you want to be informed about new issues.